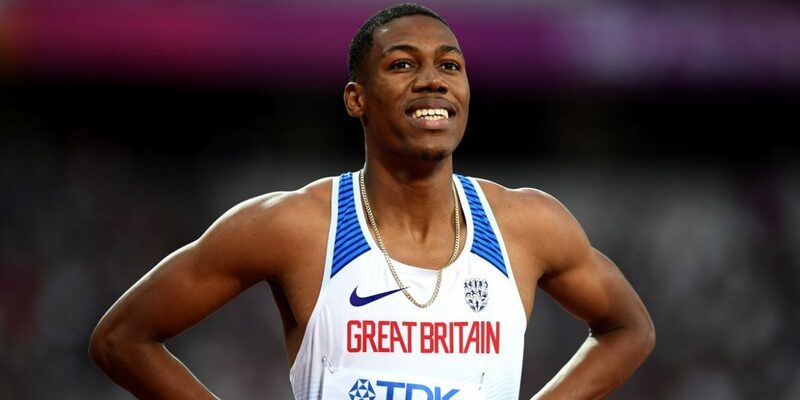 Zharnel Hughes (coach: Glen Mills) was denied becoming only the ninth British man in history to break the 10 second barrier by an illegal tail wind, as he took an impressive victory in America. Comfortably getting the better of Commonwealth Games champion Akani Simbine and Jamaica’s Yohan Blake, Hughes stopped the clock at 9.99 (2.4m/s), a mightily impressive run. Hughes fellow 200m man Nethaneel Mitchell-Blake (Dennis Shaver) was also in action over the rarely run 150m, running a great race, albeit edged out by Noah Lyle 14.77 to 14.81 (0.2). That performance was in fact a British record for a straight 150m. Chris O’Hare (Terrance Mahon) also toed the line in the men’s mile, putting the disappointment of the Commonwealth Games behind him with a second place finish in a fine 3.57.17 time. Shara Proctor (Rana Reider) was also in action in a long jump duel, but she had to settle for second with 6.32m her only valid effort. Holly Bradshaw (Scott Simpson) returned to winning ways over in Germany, a first time clearance at 4.60m seeing her get the better of her opposition with surprising ease, given the likes of Silke Spiegelburg were in the field. That height was just 4cm shy of the season’s best she set in Doha earlier this month. In the sprints, Confidence Lawson (Clarence Callender) produced an impressive run to win the men’s 100m, although frustratingly his 10.25 clocking won’t count as an official personal best due to the 3.0m/s tailwind. The final Brit in action was steeplechaser Zak Seddon (Jeff Seddon) and he can be delighted with his effort, second in 8.26.51, but more importantly inside the European Championship qualifying time. Sir Mo Farah (Gary Lough) showed that despite his recent marathon exploits his finishing kick is still intact as he got the better of Moses Kipsiro and Abel Kirui in a sprint finish down Deansgate. Passing 5km in 14.16, Farah tracked his rivals, biding his time before sprinting to victory, stopping the clock in 28.27, one second in front of Kipsiro. David Weir (Jenny Archer) showed his class to back up his London Marathon victory last month with victory in the men’s wheelchair race in Great Manchester in a time of 21:28, with Commonwealth medallists JohnBoy Smith (Archer) and Simon Lawson (Ian Thompson) in second and third respectively. Liz McTernan won the women’s wheelchair race in 34:20. In the women’s race, Tirunesh Dibaba was a runaway winner, her 31.08 performance good for tenth overall; Gemma Steel (Liz Nuttall) was first Brit home, crossing the line in 33.29. Steve Morris (James Thie) front ran his way to 1500m victory, stopping the clock at 3.59.76, his best ever season opener and some six seconds clear of his nearest rival. Find round-ups here on the Great Manchester CityGames, Night of 10,000m PBs / European 10,000m Cup and the Loughborough International.